Taste-packed spicy beef chili nachos recipe with rich guacamole made creamier by Hellmann's® or Best Foods® Real Mayonnaise. A real game-day crown winner. 1 Combine tomatoes, lime juice and jalapeno pepper in medium serving bowl; set aside. 2 Blend avocado, Hellmann's® or Best Foods® Real Mayonnaise and sour cream in small bowl with fork until desired consistency. Turn into serving bowl and set aside. 3 Heat olive oil in medium skillet over medium heat and cook onion, stirring occasionally, until almost tender, about 4 minutes. Add garlic and cook 30 seconds. Add ground beef and chili powder and cook over medium-high heat, stirring occasionally, until ground beef is cooked. 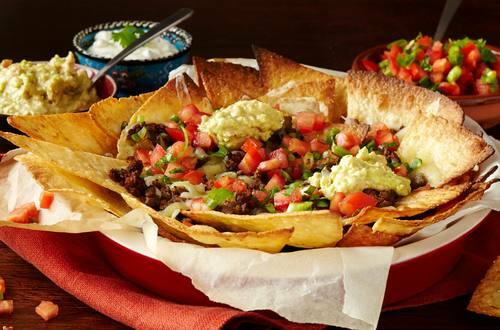 4 Arrange tortilla chips on large serving plate**, then top with ground beef and sprinkle with cheese. Broil 1 minute OR microwave 30 seconds or until cheese is melted. Garnish with tomato mixture, avocado mixture and, if desired, chopped green onions. * Use more if desired. **Use broiler-proof plate if broiling OR microwave-safe plate if microwaving.